This 2007, all original bebop album is a smooth, stylish example of Hamel's hustle. The leader has gigged around these parts for a while, and his fleet, bop trumpet, clean lines and articulate urgency deserves a bigger hearing, especially since he can write too- all dozen tunes on this disk recorded last year. With the intuitive smarts of guitarist Lee Wallace, the front line has unique textures to offer, while bass Mark Cashion and drummer Greg pilo cruise confidently through Hamel's perky compositions. Top track: The title piece is a stylish example of Hamel's hustle. 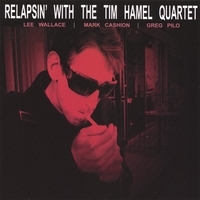 If that cool Miles Davis vibe is what you seek, then look no further than The Tim Hamel Quartet, who offer up Relapsin' (self-released) in a fashion that is not unlike those series of albums Miles did for Prestige. right down to the homage of the album title. Hamel himself is a trumpet player, and while he doesn't play like (or even mimic) Miles' in anyway, you do get the sense that he and his band know what it takes to create a proper atmosphere, where it is for two, or 200. With each song, they play in a way where they seem to know when each musician will come and go, the kind of intuition that comes from a lot of time together in the studio, at practice, and in the studio. There are times where it sounds like it's a bit of give and take, as Hamel and guitarist Lee Wallace do a few times in "Broke Again". Drummer Greg Pilo and bassist Mark Cashion offer a solid foundation to work off of in "What's Your 20? ", while Hamel's playing weaves in and out to perfection, like a cross between Freddie Hubbard and Randy Brecker. It's bebop with a lot of heart, and recorded very well with the kind of results that would easily compete with the jazz masters of yesterday and today. I would like to hear you live . Do you post your up and coming gigs in Toronto . I am a good old friend of Greg's from Sault Ste . Marie .You can give him my e-mail . Thank You .B Bpo is hard to find .